Hammerhead: The Eyes Have It! When Kenner launched its 3 ¾ inch Star Wars movie tie-in action figures in 1977 it soon emerged that kids wanted not only the major players – Han, Luke, Leia, Chewbacca et al, who appeared in a first wave of 12 carded figures, known ever after as 12 back figures – but that there was also a clear market for practically the entire cast! No matter how few the seconds of screen time, there was a place for every weird and wonderful being that had populated any of the movies in the original trilogy. 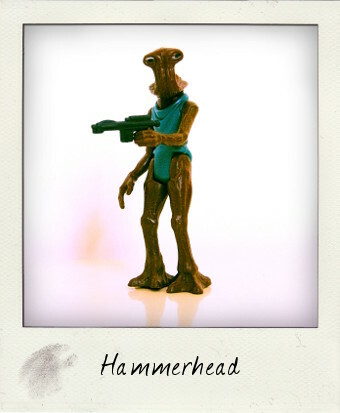 Hammerhead here, first appeared alongside those other handsome devils Greedo, Walrus Man and Snaggletooth in the exclusive Sears 4 pack Star Wars Cantina Adventure Set, which was released in time to find its way into Christmas stockings in 1978. Remember folks, this is decades before George Lucas dreamed up those complicated back stories and even more complicated names for these characters! Forget Momaw Nadon the Ithorian – who?! – this is good 'ole Hammerhead, a creature from another planet trying to have a quiet drink in an intergalactic bar! 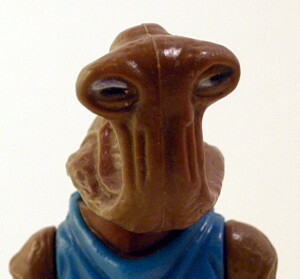 As we've seen here on numerous occasions, small variations in paint work or even dramatic differences in molds and sculpts are frequent in the vintage Kenner Star Wars line and Hammerhead is no exception. Whilst most figures seem to have been painted with his eyes looking left, there are also rarer examples of eyes looking right, looking up and looking down to excite the most completest of Star Wars collectors. Quite by chance, I noticed when I came to write this post, that my Hammerhead doesn't fit in any of the aforementioned categories and is suffering from strabismus - one eye looks down and the other looks left – an interesting variant that I've not seen before. The copyright information - © G.M.F.G.I.1978 – and country of origin – Hong Kong – run downwards on two lines that curve discreetly around the veins on the back of the left leg and this loose figure is completed with an original blue Imperial Blaster accessory. Add him to your collection now!